Include Every Web Page You Want to Index. Adding pages to your sitemap will help increase the speed at which your site indexes in search engines which means you won’t have to wait for crawlers to find them. When adding new content to your website, your sitemap (and webmaster tools) is your best friend. Let Crawlers Know The Last Time Your Page Was Updated. The lastmod attribute tells crawlers the last time a page’s content was modified. Crawlers may use this information when determining whether or not they need to reindex a page on your site. If the lastmod date has not changed since the page was crawled last it will be ignored. Let Crawlers Know How Often Page Content Is Likely To Be Updated. If you have a blog on your website or other content that is frequently updated, you can set the changefreq attribute to hourly, daily, weekly, or monthly depending on how often you post. For pages that never change you can set the attribute to yearly, or never. This can help crawlers determine how often they should check back for new content to index or let them know that they don’t need to check back at all. Possible values for the changefreq attribute are: always, hourly, daily, weekly, monthly, yearly and never. Let Crawlers Know How Important A Page Is. All of the pages that appear below the homepage in the listing have a priority of “0.9” while the homepage has a priority of “1.0”. The advantage of this is that you can help your customers find important information more quickly than if you had not set priority. With much of the web being built on Content Management Systems like WordPress or ExpressionEngine, chances are you won’t ever have to write your own your sitemap. 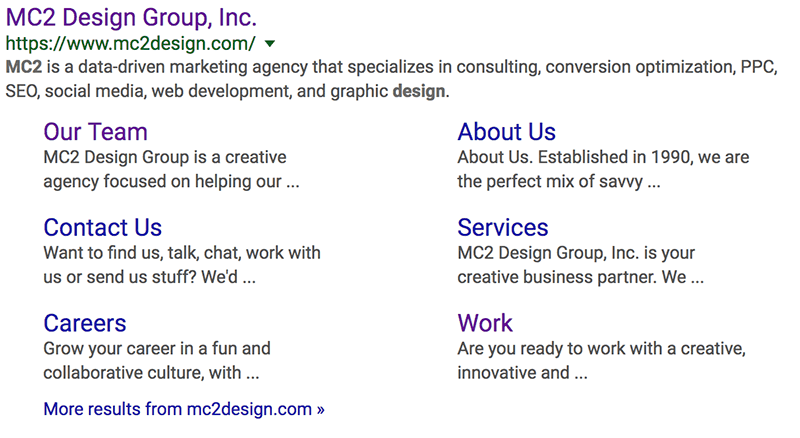 In fact, at MC2 we include a sitemap.xml with every website we build. For those of you that are building and maintaining your own websites, remember to pick a plugin, or code your own sitemap to include the attributes I’ve outlined above or you’ll be missing out on some of the main benefits of having a sitemap.